Monitoring weight loss or weight gain is something many people would like to do in the convenience of their own homes, but with so many different kinds on the market, it’s hard to find the best weight scale for home without being overwhelmed by all the available choices. Even if you aren’t on a particular diet or looking for specific results in terms of gaining or losing weight, a weighing scale is one of those things that you don’t think you need until the time comes when you do need one. 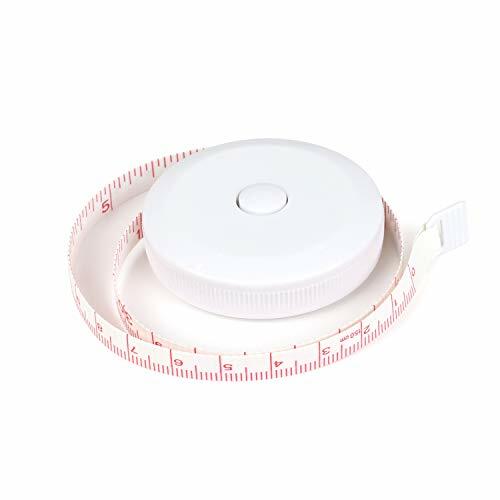 Arguably, the best weight scale for home is one that will fit perfectly in the space provided for it and will serve its purpose of tracking the user’s weight accurately. While there may be many different opinions about what makes a weighing scale the best, the reasons mentioned are among those mutually agreed on by most. After all, what’s the use of a weight scale that has all the bells and whistles including an app to track your weight on your phone, when it isn’t particularly good at the one thing it was meant to do, right? Good thing we found three excellent examples of a good weight scale, and we will share all that we have learned about them with you. If these three don’t take your fancy, then you can at least rest assured that they can be used as a guide when choosing the best weight scale on your own! 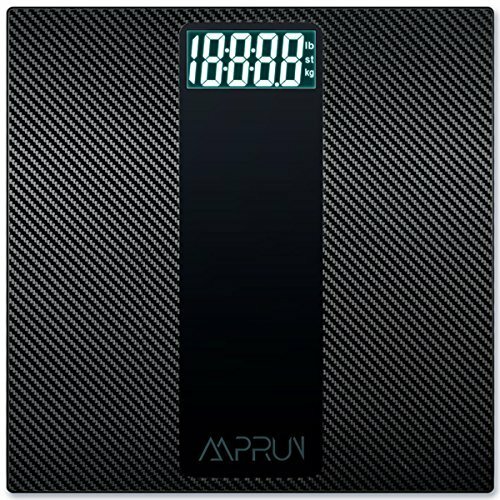 The Amprun Digital Body Weight Scale is perfectly accurate, and a great weight scale for the bathroom with its tempered glass and carbon fiber surface! A durable, heavy-duty carbon fiber surface is set on a tempered glass which prevents the user from slipping off from the platform and skidding off into the distance. Get your results instantly on the Amprun Digital Body Weight Scale’s easy-to-read LCD Backlit display. The body scale shows show measurements in kg, st or lb. It has four high precision sensors to determine the user’s wand resolutions of 0.2 lb or 0.1 kg. It has a wide weight range of 11 lbs – 400 lbs or 5 kg to 180 kg. It comes with several different functions such as an auto-on/off, an auto-zero, and indicators showing low-battery and overload warnings. It is very cool looking and stylish, definitely won’t be an eyesore wherever you decide to place it in your home. It feels comfortable and does not skid at all even on slippery bathroom tiles. The weight displayed stays on the LCD for a while after you step off, which is incredibly useful if you’re looking to compare the weight of several things so that you don’t have to rush immediately after stepping off or removing the object. The package includes two AAA batteries, and four carpet pads, which are used when the weight scale is placed on the carpet. It is CE- or FCC-approved. It comes with 12-month warranty and manufacturer provides 24-hour customer service. Due to the sensitivity of the scale, it seems to change your weight rather inconsistently when attempting to scale as accurately as possible. The SmarTake Precision Digital Body Scale doesn’t only look amazing; it’s got a range of features to boast about that will surely make you consider purchasing one for your home! The Precision Digital Body Scale is built with four high-precision sensors, showing an accuracy resolution of 0.2 lb or 3 oz or 0.09 kg. This digital body scale allows you to immediately see accurate measurements as soon as you step onto the body scale. The SmarTake Precision Digital Body Scale measurement range is from 11 lb to 400 lb or 5 kg to 180 kg. The durable 6-mm tempered glass of the scale provides incredible sturdiness as well as prevents slipping and skidding. The SmarTake Digital Body scale has a backlit LCD, which makes reading easy. It also has low battery and overload indicators. It shows three units of measurement; lb, st, and kg. It has graduation increments of 0.2 lb or 0.1 kg. It looks great with a wide variety of interior decor as it has a very sleek and modern design. The backlit LCD makes it very easy to read the numbers. The scale boots up right when you step on it and shows accurate readings each time. It is CE- or ROHS-approved. The package comes with two GP AAA batteries, which are needed to power this weight scale, a tape measure, and a warranty card. It comes with a 12-month replacement or refund warranty. Sensitivity may be an issue, as sometimes placing the scale on different surfaces alters the result given. This is not ideal if you continue to measure yourself in succession. If you’ve wanted a digital record to track your weight loss or gain, then this smart weight scale is for you! 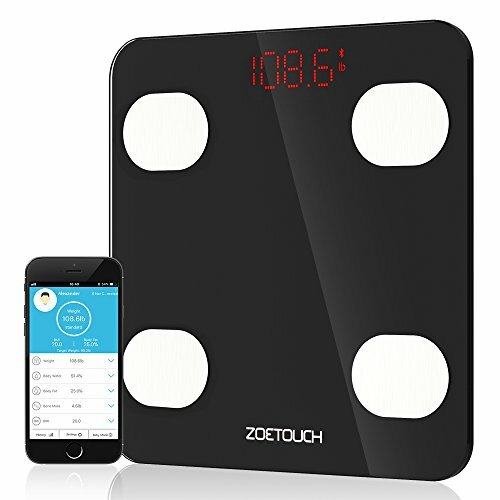 You can sync this smart digital bathroom weight scale with various fitness apps via the ZOETOUCH app which makes tracking your progress is easy. The ZOETOUCH Smart Digital Weight Scale provides you with more precise measurements with the use of Bio-Electrical Impedance Analysis or BIA technology. It is a fully sensitive Indium-Tin-Oxide or ITO conductive surface, plus four high-precision sensors. This scale measures from 5 kg to 180 kg or 11 lbs to 396 lbs, in 0.1 kg or 0.2 lb increments. There’s no need to do anything special to get results, just step on the scale, and you’ll be shown the measurement! This smart weight scale can monitor eight health index including weight, body water, body fat, bone mass, body mass index, visceral fat, Basal Metabolic Rate, and muscle mass that you can track on the app. It can detect up to 10 users, so you can easily track your family members’ health metrics. Its step-on technology makes it easy to use. It is versatile, and its design is very sleek and modern, goes well with most bathroom theme. It comes with a 12-month return or refund warranty. It may take some time to sync with your smartphone and does not support all platforms. 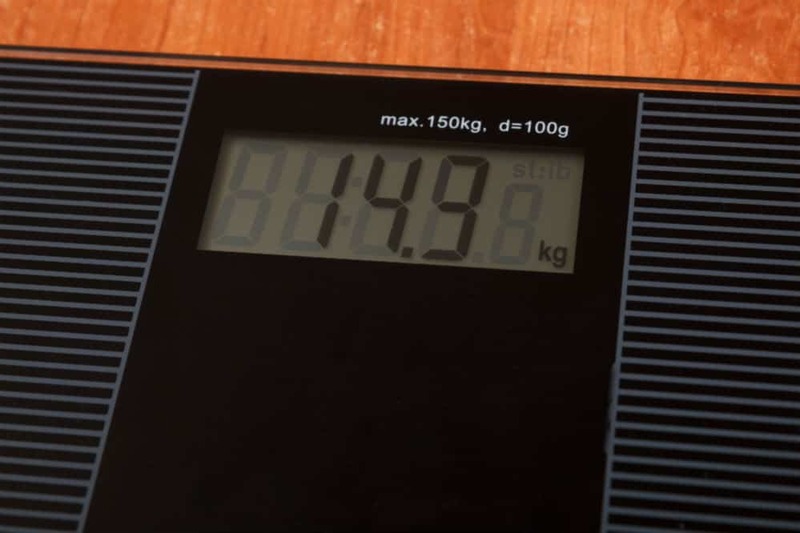 The common complaint with digital scales is that due to their sensitivity, they can show you different weights depending on different factors. These scales, however, all use modern technology to provide you with the most accurate readings possible. All these digital weight scales are either certified by FDA, CE, ROHS or FCC. Their packages already include batteries to power each item. Their manufacturers also provide 12-month replacement or refund warranty. With the thorough discussion above, we found out that all three units are great examples of what you want from a digital weight scale. If you’re looking to track your weight gain or loss, then the ZOETOUCH Smart Digital Bathroom Weight Scale is the clear winner since it shows you eight health indexes that are vital in tracking not just your weight but overall health. It also allows tracking these measurements for up to 10 users. However, If you were only looking for a basic unit that is easy on the pocket, then the Amprun Digital Body Weight Scale is your best choice. It is of modern technology and gives you accurate results as well, just without all the bells and whistles—not bad for its price.